court reporting Cypress California | Todd Olivas & Associates v3.0 | Court Reporting Services in Orange County, Riverside, San Bernardino, San Diego, Los Angeles, Irvine, Santa Ana, San Jose, Sacramento, Fresno, San Francisco, Bakersfield. TO&A employs no court reporters, interpreters or videographers of our own. The providers we send are fully qualified and reliable independent contractors. Welcome to Cypress! We're proud to have access to one of the best deposition-taking environments anywhere in town. If you're looking for a deposition suite that facilitates a quality court reporting, interpreting and videography service -- look no further! TO&A Marriott Suites is the prefect choice for a deposition or conference in the Orange County area of Cypress. 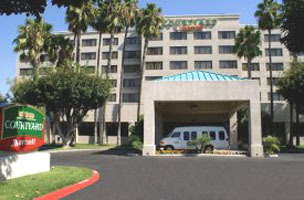 The beautiful Marriott hotel is centrally located near several Cypress area freeways including the San Gabriel River Freeway (Interstate-605), San Diego Freeway (Interstate-405), and the Artesia Freeway (CA-91). The Long Beach Airport (LGB) is 7 miles and John Wayne (SNA) is only 16 miles down the 405 freeway. Our convenient location makes getting to your next deposition a snap. We offer 8 fully furnished conference/deposition rooms for your convenience, seating from 10 up to 25 people. TO&A provides wireless and high-speed internet, LCD projectors, and videoconferencing capabilities to take the hassle out of taking video depositions. A friendly, highly trained staff is on hand to provide a multitude of litigation support services on an as-needed basis. To schedule a Cypress Court Reporter, please schedule online or call (888) 566-0253. We'll provide you with a freelance court reporter, interpreter, and videographer in Cypress, California. The court reporters we send are state licensed (where applicable), and always prompt and courteous. Our goal is your complete satisfaction which is why we only work with the best court reporters available. Our interpreters are all certified, all languages -- and be sure to tell us which dialect you need if it's an exotic language.